Volkswagen is preparing the seventh generation of its fabled hot hatch: the Golf GTI. The new April 2012 issue of CAR Magazine reveals the full story on the Golf GTI Mk7 - a full year ahead of its Geneva 2013 debut. Our artists' impressions reveal a typically evolutionary design for the new GTI. It'll sit some 30mm lower than today's car and the wheelbase is around 50mm longer, to the benefit of legroom and boot space (up to a very reasonable 395 litres). You won't mistake this for anything other than a Golf, however. The seventh generation continues the Mk5 and Mk6 aesthetic, albeit with sharper creases and lighting ornaments. Note too the trad telephone dial alloys, bespoke spoilers front and rear and the new red piping interlaced into the headlamps. The next Golf GTI is based on the new group MQB architecture, which means it really is all new. It's bristling with the latest tech and you can read our full MQB platform tech analysis here. In GTI spec, it brings an uprated 2.0-litre four-cylinder engine, now producing 217bhp and 251lb ft. Power's up only marginally, but that's a substantial torque hike, all of it on tap from 1800-5200rpm. So the next hot Golf is fast: 0-62mph takes just 6.7sec and top speed is 153mph, according to CAR's friendly faces in Wolfsburg. Will the new Golf GTI handle? The omens are good. The last few generations of fast Golf have been brilliantly judged, and the new chassis has been developed at huge expense. New is a proper limited slip diff instead of the electrically operated system of today. 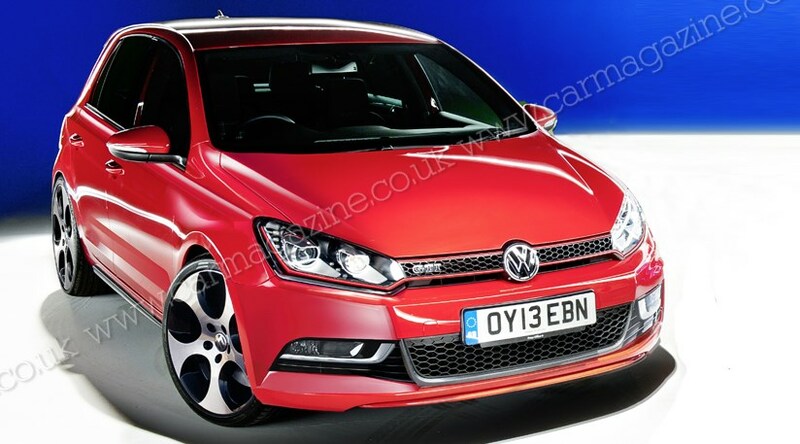 Tellingly, there will also be a Bluemotion Golf GTI this time - riding on skinnier tyres, with taller gearing and a recalibrated ECU to trim emissions while still serving up hot hatch thrills. For the full, unexpurgated story on 2013's new Volkswagen Golf GTI Mk7, don't miss the new April 2012 issue of CAR Magazine, where we compare it with the forthcoming Ford Focus ST and Vauxhall Astra VXR.